Infants on Thrones holds a listener essay competition every once in a while and I decided to include an essay of my own about how hard it is to live as a secret non believer. It's called "The Mask" and it is referring to the concept of wearing a mask of belief and trying to fit in with the belief system even though, underneath, I don't believe what is being taught. I could be your spouse. I could be your home teacher or minister. I could be one of your closest friends, or even your Elder’s quorum president or member of the bishopric. But I wear a mask. It’s not a mask you can see or feel. It’s a mask of conformity and allegiance. Of trying to fit in. 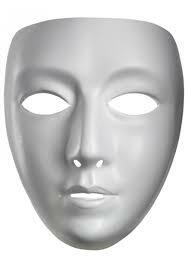 Of trying to avoid the inevitable repercussions that would result if I were to remove this mask. But I didn’t. I said what I actually believed. That I doubted. How could I be so stupid? Now the Lord will definitely hold me accountable for my friend’s soul. I would have to answer for my lack of faith, after all that could have been the very moment that God had prepared for my friend to receive the truth and now I messed it up. I obviously needed to work on my testimony so I wouldn’t make such a terrible mistake again. I strived to convince myself it was true for the sake of my parents and friends. I struggled with gaining a testimony but took the advice of Dallin H Oaks: “testimonies are better gained on the feet bearing them than on the knees praying for them.” Maybe if I just kept telling myself and others that I KNEW it was all true, then eventually I would Actually Know it was true. Maybe if I just kept repeating what others claimed to know was true, then I could know it for myself. Maybe if I just convinced myself through repetition, then God would bless me. I studied the scriptures. I studied other religions. I prepared myself for a mission. Surely, if I sacrificed 2 years of my life to spreading the gospel, God would help me know it was true. I was ready. I was convinced. I could answer any question anyone could throw at me. I knew every anti-mormon claim and how to counter it. I knew all about Joseph Smith’s wives, Masonry, the lack of DNA evidence, that whole horses and tapirs thing. I could bash with the best of them. I had knowledge and knowledge was power. It was enough to feel confident that what I was teaching was true. I was even getting answers to prayers, personal revelation, I was seeing the power of priesthood blessing work in real time! So, why this sinking feeling? I still had doubts. So, I put on my mask. As long as I can keep behaving like I believed everything was 100% true, eventually all the pieces will fit together. The mask had a smile and caring eyes. People who met me felt comfortable talking to it. It had a lot of great answers, it could bare strong testimony. But the boy underneath was still scared and worried that it could all come crashing down. I sat in my white shirt, tie, and black name badge thinking: Maybe there’s an explanation for all of this. Maybe indoctrinating myself isn’t the right answer. Sure, I think I received answers to my prayers but what about all those other times that those answers weren’t right? Like when god told me to visit a specific person but they weren’t home or when the holy ghost inspired me to turn down a certain street because there was someone there who needed to hear our message, but no one was there. Or when I was told, clear as day, that the girlfriend I had waiting at home for me was the one I was supposed to marry. But who ended up cheating on me. Maybe all those answered prayers were just…me. That’s it. Whenever the answers I receive end up being right, they’re from god, whenever they’re wrong it was just my imagination. I get it now…or do I? Then I met the one. The one who the lord must have prepared for me in the pre-mortal world. The one I was meant to marry in the temple. So we did. We made a family. We made children. This is it. This is what I’ve worked for all this time. The eternal family. Maybe I could put away this mask once and for all. Maybe all my doubts were gone. Maybe everything finally made sense and I just need to stop overthinking it. But what about this? What about that one thing I read? I remember that question I couldn’t answer before. I remember all those things I pushed to the back of my mind. Those things that might not make sense now but will make sense in the afterlife. Can I really live this way? Can I raise my kids to believe something I don’t fully believe myself? Could I lie? I...don’t…believe. I just don’t. I can finally be honest but only with myself. With the person behind this mask. I don’t believe. But I’ve worn this mask for so long, everyone around me expect me to believe. The people I’ve shared my testimony with, my wife who I’ve prayed with, my kids who I give blessing to. I can’t take off this mask. I can’t expose the monster underneath. I can’t let them ever know. What would happen? My wife expects me to be the spiritual leader in the home. The one who will help us all get to the celestial kingdom, the one who will create worlds with her someday. If I’m not that guy, then she has no use for me. If I was to reveal the non-believer underneath, I can only imagine the pain and disappointment that would follow. I’ve lived this lie for so long, I’ve tried to gain a testimony on my feet by baring it, but have ended up on my knees hopeless and trapped. So, I’ve made my choice. I will wear the mask. I will live the lie. I will sacrifice my integrity. I will do these things for their sake. For my wife, my kids, and anyone else in the church that I serve. I can do this with the futile hope that one day, maybe I can be me. That one day, maybe I can remove the mask without fear. But for now, the mask is all you will see.